Ensuring civil rights and civil liberties for: LGBTQAI, Women, Asian American and Pacific Islanders, African Americans, Native Americans, Latino/a Americans, and Muslim Americans, amongst other diverse populations. We shall form coalitions designed to solve problems of joint concern with racial, ethnic, LGBTQ, unions, environmental groups and others who understand the interconnectedness of all struggles for equality. All memberships shall be renewed annually on the first general membership meeting of February. If dues are not paid on or after that date, the Member shall become inactive until they have renewed. Inactive members shall not have membership privileges, including privileges to run for elected office or vote on club business, endorsements, or officer elections. Members who renew may resume all of their club privileges. Dues are based on a sliding scale according to each member’s financial situation. A new Member’s voting privileges related to matters covering election endorsements, club officers, and bylaw amendments or suspensions go into effect at the third regularly-scheduled general membership meeting. A Voting Member would need to have attended two out of three sequential general body meetings to gain membership. The Member must maintain his/her membership by attending one meeting per three months or have shown commitment as approved by the Membership Coordinator. Coordinate the recruitment of new members in different communities, particularly among students, LGBTQ communities, Women, Asian American and Pacific Islanders, African Americans, Native Americans, Latino/a Americans, and Muslim Americans, Unions, low-income families, amongst other diverse populations not well-represented by our membership body, as well as the different neighborhoods of San Francisco. Nominations of officers shall be held at the regular meeting of the Membership in February of each year. An eligible voting member seeking office must be nominated by another voting member at the January meeting. Additional names may be placed in nomination by other voting members at the February meeting prior to voting. Newly elected officers shall take office immediately upon election. Elections of Officers will take place in the first meeting of February, through a ranking vote system by ranking candidates from a scale of 1 to 5 points. The candidate with the highest point will take the position. Candidates for each positions will be given an opportunity to speak briefly to the Membership about their suitability for the role. One person can run for more than one officer position, but can hold only one position at a time. If a candidate wins more than one office in a given election, that person will be granted the right to choose which position they desire. Term limit for the same office is two years with the opportunity for an officer to run again one year later. Term limits are waived if uncontested. In the event of vacancies in the office of Chair, the Membership Coordinator, or, if unavailable, Correspondent can take the responsibilities of the Chair until an election can be held. Such an election shall be held at the next membership meeting, not to exceed one month’s time, provided the membership has two weeks written notice of the pending election. Vacancies in the offices of Membership Coordinator, Recorder, Correspondent, and Treasurer may be filled at any regular membership meeting, if such two weeks notice is given. Should any member move for the dismissal of an officer of the Club, and a second is made, that motion shall be recorded in the minutes of the meeting for the review of all members and shall be voted on at the next meeting. The Correspondent shall notify all voting members in advance via email or regular mail, whichever is the prefered form of communication, unless the Correspondent is the officer in question, wherein the Recorder will notify all voting members. The person accused will be notified by registered mail. Dismissal of any officer shall require a two-thirds affirmative vote of the members voting in attendance, and shall not occur without quorum. With the exception of the Executive Committee, any member can choose to take part in any committee by notifying the Membership Coordinator. Any member choosing to leave a committee must notify the Membership Coordinator. The Executive Committee shall consist of all elected officers. Each officer shall have one vote. The Executive Committee shall meet once a month. Any elected Executive Committee member must not have two or more consecutive unexcused absences to Executive Committee meetings, and must not have more than 3 unexcused absences during each one-year term. An unexcused meeting is one where no prior notice with a supporting reason has been given to the Chair or Co-Chairs in anticipation of an absence. It shall be the duty of the Executive Committee to plan the agendas of the general membership meetings; to invite special speakers covering topics of interest to club members; to act on behalf of the Club on routine matters and in emergency situations; and to oversee the standing of Club committees and to ensure they function on a timely basis. A quorum of the Executive Committee shall be a majority of its members. Regular meetings of the Executive Committee shall be set by the general membership, typically two weeks from the general body meeting, and the dates and times shall be published in the club email newsletter. Meetings shall be open to all club members, but voting shall be limited to members of the Executive Committee. Special meetings of the Executive Committee may be called at the request of the Chair, or upon the request of any four of its members. Reasonable attempts such as email and phone contact shall be made to notify each member of the Executive Committee of a special meeting. The chair of the Endorsement Committee shall be the Endorsement Coordinator. It shall be the duty of the Endorsement Committee to monitor the local, state and national political climates; to initiate club action on issues; to investigate and conduct impartial hearings on issues confronting the Club and then make recommendations to the general membership; to organize and conduct the endorsement process for all local non-partisan, Democratic primary and general elections, including candidates and propositions; and to coordinate voter registration efforts. The chair of the Outreach Committee shall be chaired by the elected by the Community Outreach Coordinators and Advocates for Diversity, who shall comprise the membership of the Committee. The Committee will work with Membership Committee on community outreach events designed to recruit new members from diverse groups, form alliances, attend and support meetings and actions by allied organizations, and be advocates for those communities to our group. The Events & Fundraising Coordinator shall chair the Events & Fundraising Committee. It shall be the duty of this Committee to plan and coordinate fundraising and events activities designed to give the club a solid financial base and to ensure the club’s ability to financially contribute to the interests of this group, organize social events for the Membership, as well as attract the public to external events of the Club. Any use of funds by committees require the approval of the the Executive Committee. Any actions taken by the club should be reported to the Correspondent, to be distributed in the newsletter. No committee or caucus may endorse candidates or propositions, however they may provide recommendations to the Club. No committee or caucus may use the Club’s name in support of candidates or issues without the approval of the Club, or, in an emergency, the Executive Committee. Regular meetings of the General Membership shall be held at least once a month on a date determined by the Executive Committee. Any motions of business may be in order. The Agenda for each meeting shall be sent out 10 days prior to the meeting by the Chair. The Chair will receive any input from members and amend the agenda. Special General Membership meetings of the Club may be called by the Chair, by a majority of the Membership at a regular meeting, or upon written demand from ten percent of the membership roll. Meetings for the planning of particular events or for subcommittees can be called with the consent of 30% of committee members or by the committee chair. Advance written notice shall be given to the Membership for all meetings of the Club, as well as for all Executive Committee meetings when feasible. A quorum for any general membership meeting shall consist of either 1/3 of the Club’s Membership, or twenty members, whichever is less. If a member is unable to attend a meeting, but wishes to participate in voting, the member must notify the Membership Coordinator of their anticipated absence at least 10 days prior to the meeting, and cast their vote with the Elections and Endorsement Coordinator at least 1 week before the scheduled meeting. The following motions for a Membership vote shall be in order only if the matter has been published and announced to the Membership at least 10 days prior to the voting meeting: the annual election of Club Officers; motions for officer dismissal; and votes to discipline Club members for violations of Club procedures, as listed in Article VII. The following motions for a Membership vote shall be in order only if the matter has been announced at the previous meeting and published and announced to the Membership at least 10 days prior to the voting meeting: the election of club officers to fill vacancies; and motions to rescind endorsements. No vote to endorse a candidate or proposition shall be allowed unless the Membership, at a prior general membership meeting, has approved holding the endorsement vote on the date such vote will take place, and notice of the endorsement vote is published at least 1 week prior to that voting meeting. The Rules of Order shall govern procedure to the extent that they are consistent with these bylaws and those of other bodies with which this Club may join. Consensus will be attempted at all meetings. Members are expected to treat one another with respect and maintain civility during our Club’s meetings. Every member shall have the right to expect that club meetings and functions shall be safe environments. No member shall make disparaging remarks about any other member in a public forum or meeting of this Club based on a member’s status, identity, age, class, ethnicity, race, disability, gender identity, sexual orientation, national origin, immigration status, language, or religion. No members shall engage in sexual harassment. Sexual harassment is any unwelcome conduct of a sexual nature which makes a person feel uncomfortable, offended, humiliated and/or intimidated. Sexual harassment can involve one or more incidents and actions constituting harassment may be physical, verbal and non-verbal. Examples include, but are not limited to: unwelcome physical contact, verbal or written comments of a sexual nature, repeated unwanted social invitations for dates or physical intimacy, condescending or paternalistic remarks, or sending unwanted messages and/or images of a sexual nature. No member of the club shall destroy club property. No member shall threaten or carry out threats of bodily harm; harass members at a member’s home, workplace, in a public forum, or through excessive phone or email contact; or threaten, embezzle, or extort club finances. No member shall publicly misrepresent the Berniecrats or positions which the group has adopted such that the name of the group is used to further objectives that clearly contradict our platform (statement of purpose). No membershall actively and knowingly pursue an agenda which is contrary to the statement of purpose, or misrepresent their affiliations when asked. If any Member violates the aforementioned provisions, any other member may file a complaint against that person with the Executive Committee, which shall then make recommendations to the Membership. If a violation of civility is alleged, the Chair shall notify the Member against whom the complaint is charged. That person shall be provided five days to respond to the allegations in writing. If no response is received within five days, the Elected Officers shall determine, by a majority vote, whether a violation of these provisions has taken place. If a response is received, the Executive Committee shall appoint a subcommittee to consider the evidence concerning the allegations and shall report back to the Executive Committee their findings of fact. If the accused or accuser are members of the Executive Committee, they shall not participate in the related discussion or decision. If the Executive Committee finds that the charges against the member are valid, it may recommend no action, probation, censure, or expulsion, in that order, according to the severity of the charge and whether similar conduct by the member has occurred in the past. This recommendation shall be taken up by the general membership and voted upon at the next general meeting of the Club following notice. The recommendation of the Executive Board shall require a vote by two-thirds of the members present to be sustained. No candidate for either public or party office or ballot proposition shall receive an endorsement from the Club unless the Membership has been notified as specified in Article VI, Section E. In order to be endorsed, candidates or propositions must receive at least 60% of the votes cast. Multiple ballots shall be permitted if a 60% supermajority is not achieved on the first vote. Members for the Club running for public office shall abstain from a vote pertaining to the office they are running for. To rescind an endorsement, a two-thirds affirmative vote shall be required. For all single-seat, single-choice races (such as President, Senator, Congressperson, Governor and other statewide offices, State Senate, and State Assembly), all eligible candidates will appear on one ballot and voting members may score as many candidates as they desire by ranking any or all of the eligible candidates on a scale ranging from zero to five. All of the ballots will be counted, and that number will be multiplied by the maximum ranking of five, resulting in a maximum ballot score. Then each candidate will have his or her individual rankings summed. If no candidate receives a sum equivalent to or greater than 60% of the maximum ballot score, then no candidate will be endorsed. If only one candidate receives a sum equivalent to or greater than 60% of the maximum ballot score, then that candidate will be endorsed. If more than one candidate receives a sum equivalent to or greater than 60% of the maximum ballot score, then the candidate with the highest score wins the endorsement. In the case of a tie, the Executive Board is empowered to hold an emergency runoff in order for the Membership to determine one winner. For all single-seat, multi-choice races with more than one candidate (such as Mayor, District Attorney, City Attorney, Sheriff, Treasurer, Assessor-Recorder, and Supervisor), all eligible candidates will appear on one ballot and voting members may use rank choice voting to indicate their first choice, second choice and third choice. If any candidates first place votes are enough to get them a majority, then they will be the winner. If no one has a majority of votes, the last place candidate will be eliminated, and any ballots with that candidate as first choice will be changed to considering their second choice. If no one has a majority of votes again, then the new last place candidate gets eliminated, and their voters’ ballots then go to the voter’s next choice. This goes on until a candidate wins. In the case of a tie, the Executive Board is empowered to hold an emergency runoff in order for the Membership to determine a winner. The Club shall not endorse more candidates than allowable. For all multi-seat, multi-choice races (such as Board of Education, Community College Board, and San Francisco Democratic County Central Committee), all eligible candidates will appear on one ballot and voting members may score as many candidates as they desire. Any candidate must receive a sum equivalent to or greater than 50% + 1 of the maximum ballot score to be endorsed. If the number of endorsed candidates exceeds the number of seats available, then the candidate or candidates with the fewest votes will be eliminated. In the case of a tie for last place, the Executive Board is empowered to hold an emergency runoff in order for the Membership to determine a last-place winner. The Club shall not endorse more candidates than seats available. The Membership must vote in the affirmative by at least a 60% supermajority for the endorsement of a yes, a no, or a no recommendation vote to become official. If no position receives the sufficient number of votes for an endorsement, then the Club’s official recommendation on such a ballot measure will be no position. 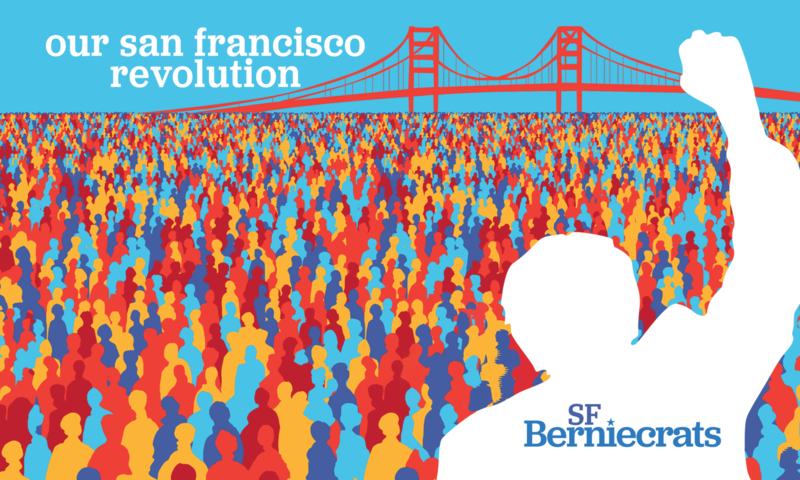 Use the name of the San Francisco Berniecrats and to include it with all candidate literature which lists organizational endorsements. Candidates are permitted to join the Club and pay their annual membership dues. However, any other financial contributions may not be permitted. Refrain from giving financial support to slate cards or other campaign materials that endorse propositions seeking to deny rights to any person on the basis of age, class, ethnicity, race, disability, gender identity, sexual orientation, national origin, or religion; or that oppose propositions seeking to secure basic rights for such groups. Refrain from taking public positions in favor of legislation or policies that deny rights to any person on the basis of age, class, ethnicity, race, disability, gender identity, sexual orientation, national origin, or religion; or that oppose propositions seeking to secure basic rights for such groups. A list of such legislation and policies shall be compiled by Endorsement Committee and approved by the Club for distribution to candidates. Refrain from hiring campaign consultants known to have worked on campaigns that have used tactics appealing to prejudice against any person on the basis of age, class, ethnicity, race, disability, gender identity, sexual orientation, national origin, or religion. A list of such consultants shall be compiled by the Endorsement Committee and approved by the Club for distribution to candidates. Refrain from engaging in tactics appealing to prejudice against any person on the basis of age, class, ethnicity, race, disability, gender identity, sexual orientation, national origin, or religion. Candidates who have violated Article VIII, Section C. during a period of five years prior to the endorsement vote for the next election shall be ineligible for the Club’s endorsement for that election. If a violation of Article VIII, Section B. is alleged after the Club has endorsed a candidate, the Chair shall notify the candidate, providing that person twenty-four hours to respond to the allegations in writing. If no response is received within twenty-four hours, the elected officers shall determine, by a majority vote, whether a violation of these provisions exists. If it is determined that a candidate has violated these provisions, the endorsement shall be withdrawn, and that candidate shall be ineligible to receive our endorsement for a period of five years. All candidates who receive the Club’s endorsement shall be notified of these provisions. Candidate or proposition campaigns may not use the Club’s name in any manner (i.e. “received most votes”) unless they have received the Club’s endorsement. If a candidate, having been apprised of this provision, violates it, he or she shall be ineligible to receive the Club’s endorsement the next time he or she runs for public office. All candidates who receive our endorsement shall be notified of this provision. Any Member in good standing may move an amendment at any regular membership meeting. If a motion to amend is seconded, the Membership shall be notified as provided in Article VI, Section D. At the meeting to consider adoption, the proposed amendment must receive a two-thirds affirmative vote of members voting, in order to be incorporated into these bylaws.